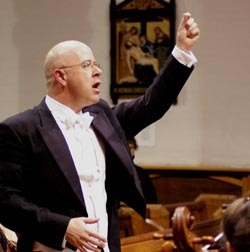 Julian Harris formed the St James’s Singers in 1985 when he was organist and choirmaster at St James’s Church, Alveston in Warwickshire. Since then, the choir has grown in size and stature to become one of the area’s leading ensembles. Over the last thirty years they have passed every major choral milestone from Bach’s St John Passion to Beethoven’s Choral Symphony. They have worked with many leading internationally established stars including Catherine Bott and Ian Partridge, and have worked with young soloists who have gone on to achieve worldwide recognition such as soprano, Carolyn Sampson, and tenor, Andrew Kennedy. The choir regularly performs in the Collegiate Church of Saint Mary in Warwick and in other local towns including Chipping Campden, Stratford-upon-Avon and Royal Leamington Spa. In 2016 the season began with a concert at the Guild Chapel in Stratford upon Avon to commemorate the 400th anniversary of Shakespeare’s death. In the autumn the choir gave a lively performance of Carl Orff’s Carmina Burana. The season concluded with the traditional Christmas Concert in Warwick when eminent actor Julian Glover CBE was the Reader. The 2017 season began with a performance of Haydn’s The Creation with a full orchestra and soloists. There followed a charity concert in Alveston in October and in December the traditional Christmas Concert with readings and festive music ended the year. The Mozart Requiem and Haydn’s Theresienmesse opened the 2018 season in April. In October they present a concert to commemorate the end of WWI with the Fine Arts Brass and Reader, Kim Durham. The season will end with the traditional Christmas concert of festive music and readings at St Mary’s Church on Saturday, 22 December. The St James’s Singers always use the full orchestral accompaniment in all works and, where appropriate, use the authentic instruments. The choir has members of all ages, and subscriptions are waived for those who are students or who are in full time education. 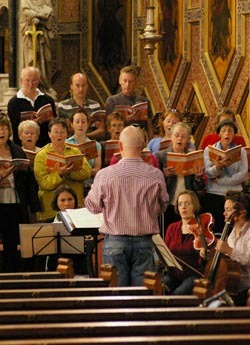 Although the choir is based in Warwickshire, choir membership is drawn from London, Bristol, and from the South Coast to Birmingham and Coventry. The choir rehearses at St James’s Church at Walton Hall just outside Wellesbourne on alternating Thursdays and Fridays. The current rehearsal schedule is published on the Members Page. The choir also performs at Weddings and private functions. 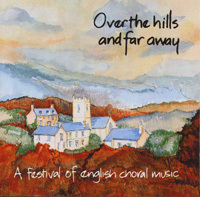 Julian conducts three choirs; two under his ‘Saint James’s Singers’ banner and the Banbury Choral Society. He teaches A-Level/GCSE theory, piano singing, composition as well as the Kodaly Method and is currently Head of Music at Kitebrook School. Former pupils have recently won Oxbridge Choral Scholarships, made debuts at BBC Proms in the Royal Albert Hall and have successfully auditioned for the Genesis Sixteen. Julian toured Venice in 2015. Playing Vivaldi on Vivaldi’s organ in the Pieta was a particular highlight. He has conducted at Winchester Cathedral and Symphony Hall Birmingham. He has had a long and varied career embracing work at the RSC and Birmingham Repertory Theatre. He has played and conducted all over Europe including Saint Peter’s in Rome as well as in the country’s major halls, including the Queen Elizabeth and Cadogan Halls in London. Julian is in demand in the Midlands and in London as a conductor, composer, arranger, accompanist and teacher. He has conducted the Saint James’s Singers in Evensong at St Paul’s Cathedral as part of their 30th Anniversary celebrations. He plays the organ regularly across the South Midlands and North Cotswolds including at Holy Trinity Church, Stratford-upon-Avon and St. James’s Church, Chipping Campden. His Saint James’s Singers have recorded for the Royal Shakespeare Company (Wendy & Peter Pan) and he returned to the Swan Theatre, Stratford-upon-Avon to conduct The Holly & The Ivy in December.